In his text, Listen: A History of Our Ears, French musicologist Peter Szendy asks, two questions: “Can one make a listening listened to?” and “Can I transmit my listening, unique as it is?” “This is the underpinning of what I’m trying to do with my life,” says Australian-based composer, artist and curator, Lawrence English. For Folio magazine, English discusses the weaponisation of sound, his approach to his practice and how we listen to and experience sound. Vardui Sharapkhanyan:In recent years, your work has addressed the relationship between sound, sonic weapons, violence, terror and trauma. 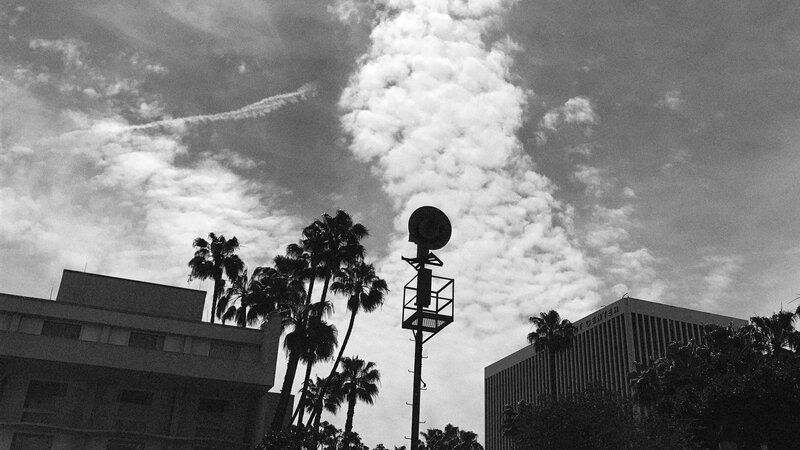 For your residency at PAC, you were researching and documenting civil defense sirens that were installed in Los Angeles after the end of the Second World War. These were placed as a sonic signifier, a warning system for disaster in the 1950s and 60s. Your research interests focus on the weaponization of sound as a recent phenomena, and the shift from communication signals of distress to devices of control and power. Can you talk about the ways in which this shift affects the city and what they might symbolize now? Lawrence English: The civil defense systems installed in Los Angeles is incredibly emblematic of a certain approach to sound that was maintained during the 20th century. This approach, which reflects the institutional/civil/military interests in sound as a mechanism for a kind of geographically distributed communication, was essentially a kind of narrowcast. These systems and others like them allowed sound, and its message, to be delivered to a geographically focused area such as a city or a battlefield. In the case of the Los Angeles Civil Defense System, the possibilities of communication were limited to two distinct messages, denoted by the tones of the sirens used in the system. These siren tones essentially denoted states of ‘alert’ and ‘alarm’. The siren was in place then to offer protection to people by giving them a chance to find shelter or protect themselves in other ways against impending threats. The sound of the siren was there in defense of civilian life. Sound was also used as a means of defense and of protection, allowing people to be served by that sound. More broadly, the way sound like this operated in the city was about a wholesale distribution, something that could reach communities and form a kind of connected network across a city or county. This both reflected the nature of technology in the 20thcentury and also the way in which information systems existing outside the broadcast networks of the time distributed communication. Specifically, the more omnipresent sounding of spaces was a result of the way in which sound could be used within most domestic settings. It was still largely ‘rogue’ in that it was less controllable than say mediums such as light. During the second world war, a spotlight offered a very direct, singular vision of what lay in its path, by contrast sounding devices such as the acoustic mirrors used in the UK or some sonar devices offered far less clarity of their subjects. As we have moved into the 21st century, we’ve seen a number of changes in the way sound can be deployed in civil settings. These changes reflect significant changes in the way sound can be controlled and also used in ways that were largely unthinkable even 30 years ago. The directional capability of sound, as well, as the ability to output very loud sounds from relatively small scale devices has completely shifted the potential for how sound can be used and moreover, in what contexts it can be used. With this is mind; I see the siren as a critical marker of this shift. The siren, as we understood it in the 20th century, was a device primarily for communication and for civil defense. Today, with the arrival of technologies such as the Long Range Acoustic Device (LRAD), which allows for adjustable beam width from very narrow to more wide applications, as well as incredibly loud sonic output, the role of the siren is markedly different. You only have to look, and listen to footage from various protests in recent years to experience how the siren no longer is used for civil defense, but rather civil assault. The siren in the LRAD, as the material content of the sound, has been developed to create maximum impact through the use of frequencies that when perceived, are most sensitive to our ears. At loud volumes, this is tremendously uncomfortable, but more concerning is the fact that the LRAD can put out enough volume to cause permanent auditory damage. There’s a rising tide of litigation around the misuse of these devices, the case of Karen Piper who sued the City Of Pittsburg being one of the most high profile cases. So it’s an important time to consider the relation we have with the siren and with sound more generally. Somehow we shifted from an approach to sound that was about civil defense to sound used in civil assault and it’s critical we understand how this shift has occurred. VS: During the field research phase of these sirens in Los Angeles, you encountered numerous passersby who were interested in talking to you about their relationship to these sirens. Some were old enough and around when they were used and others had no idea what they were but recognized them as these architectural structures throughout Los Angeles.In your essay, Relational Listening you examine the different dimensions and ways of listening, specifically the psychological listening or an internal listening that goes beyond the experiential mode and the physiological listening where sound occupies and is understood by the body. Will you incorporate these interactions in your work? If so, how do you see it manifesting? LE:Listening is a fundamental aspect for the work that I do. Obviously, it’s necessary for approaching sound in the first place, but furthermore I feel that listening speaks to a variety of other considerations that are increasingly important today. I am conscious of the idea of being present and attentive to sound, as lets face it, the moment a sound is perceived it can never be returned to again. Sound is a constant and dynamic flux, and is perpetually on the threshold of extinction. This speaks more broadly to the sense of distraction many of us feel in the day to day, for me listening is a means of address this. I am also conscious of the questions of agency that exist in the act of listening. Listening can be an exercise in control and power. It can be very empowering for people and I think this is increasingly important in the current political climate, the terrain of the mind, and the body, are the first positions from which we can interrogate what is happening around us and subsequently action change. As to the question of the body more directly, there’s no question that sound is physiologically affective. Obviously there is a cost from exposure to extended periods of loud sound that ‘leaves a trace’ on us, but there are other examples too. In fact, shortly after the first civil defense sirens were installed in Los Angeles an event took placed called ‘The Battle Of Los Angeles’, where the city thought it was under attack from enemies. The sirens were sounded and two people suffered heart attacks as a result of that sounding. In this sense, sound directly manifests its presence on the body. In terms of this project, I am conscious of all of these positions in how the research will inform the creation of the work. It has been fascinating to listen to people on the streets recounting their experiences and memories of the sirens. It has been powerful to recognize how much a sound can evoke memory for people! VS: Your investigations on the use of sound in situations of conflict as a weapon have been incorporated in your work, particularly, the signals of the Long Range Acoustic Device (LRAD) for your most recent album Cruel Optimism—inspired by the critical writings of theorist, Lauren Berlant. For those who are unfamiliar, the LRAD was originally created for use in marine environments to communicate with one another. Its maximum range in sound is approximately 160dB, which he describes “is like standing next to a jet engine.” These devices are being deployed more and more by police in America for crowd control particularly in the Black Lives Matter protests. The use of the LRAD as a weapon continues to exist even after people reported to have suffered from permanent hearing damage. On another protest record, Wilderness of Mirrors—namedafter a line from T.S. Eliot’s 1920 poem, Gerontion—acoustic instruments and field-recording are used. Can you discuss your approach to the process, techniques, methods you use in relation to the concepts and ideas behind your work? How do your performances differ from recordings to reflect how our body experiences sound? LE:In terms of my musical practice, these kinds of questions are central to the work. I am not the kind of musician who can simply conjure sounds out of the air. When I meet musicians who can do that I am so in awe of that ability. For me, the music comes as a response to outside stimulus. I truly feel that music, as an art form, is entirely embedded in socio-cultural contexts. It is born from these contexts. Work that attempts to removes itself from these structures; I tend to be less interested in, frankly. So for me, both of those recordings you mention were born through a process of research around issues that we are all very conscious of. For Cruel Optimism, I spent many months researching the growing refugee crisis, something we as Australians have had to face head on with a government who has summarily failed us in terms of our obligation to these people. Around that topic I also spent a lot of time examining relational issues, for example the role of drones and their impact on this crisis and others, also what are some of the societal manifestations around the anxieties that have led to these situations. I found Lauren Berlant’s work a critical tool for unpacking that. I think there can be a very tangible application of theory into creative works. For me they share a very symbiotic relationship. There’s a connectivity that is made possible through the exploration of these questions. Though the methodological tools may not be the same, and the expressions end up occupying difference zones, the desire to better question and interrogate ourselves and the world around us unifies these approaches to investigation. As to the performative side of the work, that is very much focused on the notion of the body as an ear and exploring the affective nexus that exists between audition and touch. There’s a powerful moment where sound transcends the auditory and becomes realized physically. That interplay is something I have been exploring for some years and it remains one of the key concerns for me in terms of live performance. VS: On Sound and Site-Listening—a field guide on the act of site-listening— you discusses how the brain selectively filters out sounds we are constantly bombarded with in our environment. This filter allows us to manage the onslaught of overwhelming auditory data we receive daily. The essay asks readers to turn this filter off and allow themselves to engage in sounds they consciously and subconsciously suppress. It calls us to consider the way we listen and how its role plays an integral part in our understanding and relationship to our surroundings as a result. I imagine that you are constantly listening and curious when you choose to turn it off? LE:Actually I am perhaps no different to others and am as guilty, if that’s the way to frame it, as anyone else in terms of not always being that attentive to what is around me. I have the opportunity to be more engaged in that act I suppose, but still I spend a lot of time as loosely connected as anyone else. I think actually that it’s important to realize that listening, in the way that I describe, is actually not something that can be maintained indefinitely. It is about a temporal relation that is tapped into and out of. In some simple way you can think of it as a kind of exercise. You can’t run forever or lift weights, or box, or whatever you like to think of. These are activities that are durational, the body can’t sustain them indefinitely and I feel that listening is the same. It is fatiguing to listen deeply, it requires an application of the self that is not a given state, but rather something we develop across time. The more we practice it, and more we recognize the complexity of the act, the richer and more meaningful it becomes to us. Perhaps it’s best to ask when we should turn it on, rather than turn it off. VS: What are you currently working on? LE: As for what I am working on…this instant I am finalizing the paperwork for my Doctorate, which I was just awarded last week!